Thanks to everybody who came to the last show. BRILLIANT performances by Plot, Catfight and Abuse The Youth. This week we have another stellar line up with an international flavour as well. 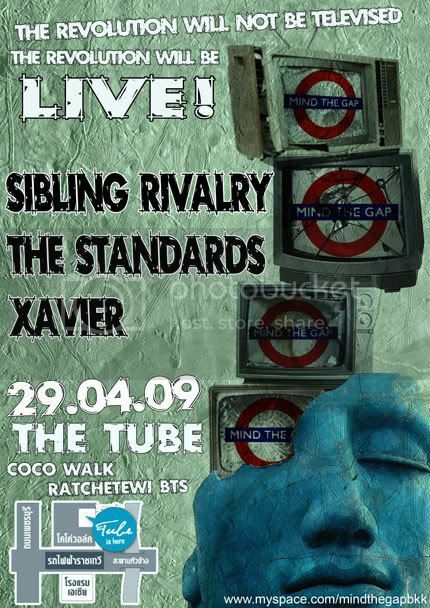 Sibling Rivalry are from South Africa but have been resident in Bangkok for the last few months, they make the Mind The Gap debut this week. You may have seen them playing the bars around Ekkamai and Thong Lo. If you haven't, they play a powerful combination of Rock and Ska excellent adrenalin charged performances. The Standards make a welcome return, giving you a wholesome chunk of Brit-Thai goodness! If you haven't seen this band....what's your excuse! We also have Xavier who play The Tube for the first time....think Post Punk, New Wave...excellent!